An ancient water god is a major destination of Kumano Kodo trail. Kumano Nachi Taisha 「熊野那智大社」, is one of the three grand shrines of Kumano, located in south Wakayama, a few kilometers inland from the coastal hot spring resort of Katsuura. Kumano Nachi Taisha Shrine has been influenced by Buddhism, like other two Kumano shrines since Buddhism arrived in Kumano in the mid 6th century. This sacred shrine stands as a part of a large religious complex with neighboring religious sites, Seiganto-ji Temple「青岸渡寺」 and Nachi-no-taki waterfalls「那智の滝」. Actually, those temple and shrine’s buildings here used to be functioned as one religious institution until politics forced the two religions to split in the 19th century. The buildings of both the shrine and the temple here are very impressive. Nachi-no-taki is worshipped as a water god. Nachi no taki, the tallest waterfall in Japan, at 133 meters has been worshipped as the abobe of a Shinto deity from ancient times. It was the original religious site in the area before Nachi Taisha and Seiganto-ji being built here. There are two rocks at the top of the falls that are the guardian kami (gods) of the falls and of the Shinto shrine. Kumano Nachi Taisha also enshrines Musubi-no-Kami, the deity of marriage. Visitors would be impressed by the natural power and beauty of the falls. Seiganto-ji Temple, a beautiful Buddhist structure stands in the foreground of the falls. 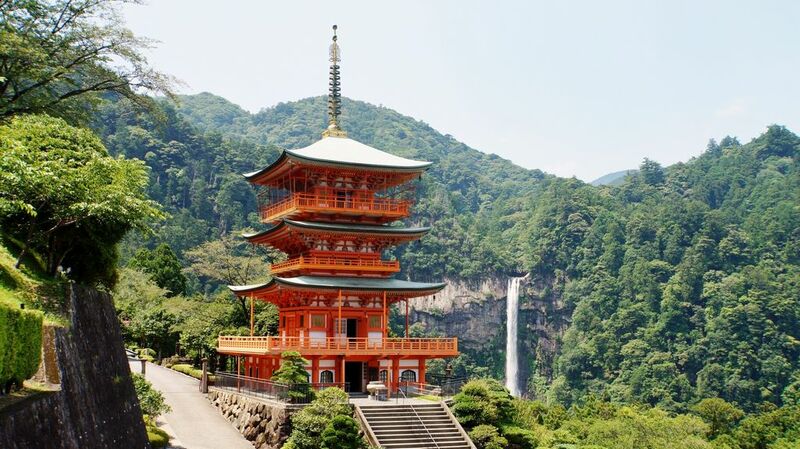 Its famous three-story pagoda with Nachi no taki waterfalls is a striking sight. Daimon-zaka, a centuries-old stairway is believed to be a pathway to heaven. Nachi Taisha was one of the main destinations of the Kumano Kodo pilgrimage routes. For visitors who want to experience the trail a bit, a hike up the Daimon-zaka「大門坂」, leading from the base of the valley up to Kumano Nachi Taisha Shrine is the best option. This stone paved, gently stairway sheltered under a canopy of evergreens leads you 600 meters of the Kumano Kodo Pilgrimage route to the gate of Nach Taisha. There are Heian Period costumes for rent at the Daimon-zaka rest area to enjoy more ancient trail, however visitors can get a real taste of the Kumano Kodo atmosphere by just walking along Daimon-zaka. ● Women in Heian Period costumes. Access : 30-minute bus ride from Kii-Katsuura station and 20-minute bus ride from Nachi station on the JR Kisei main line to Nachi-no-Taki-mae. Buses stop at the base of the Daimon-zaka trail (“Daimonzaka” bus stop) and at the entrance to Nachi Waterfall (“Taki-mae”) before arriving at the base of Nachi Shrine (“Nachi-san”).